Nintendo's newly-announced iOS game, Animal Crossing: Pocket Camp, has soft launched in the Australian iOS App Store, a launch rollout that Nintendo has begun to favor as a way to test its iOS apps prior to a worldwide debut. According to new data gathered by Sensor Tower, Animal Crossing: Pocket Camp climbed to the top of the Australian App Store much faster than either Super Mario Run or Fire Emblem Heroes. Animal Crossing: Pocket Camp debuted quite high among all iPhone apps on the Australian App Store, hitting around number 2 within the first hour of its soft launch on October 25. Afterwards, the new game reached the number 1 spot on the Australian App Store within 12 hours of its debut. Animal Crossing: Pocket Camp is Nintendo's fourth smartphone game made in partnership with developer DeNA, following Miitomo, Super Mario Run, and Fire Emblem Heroes. 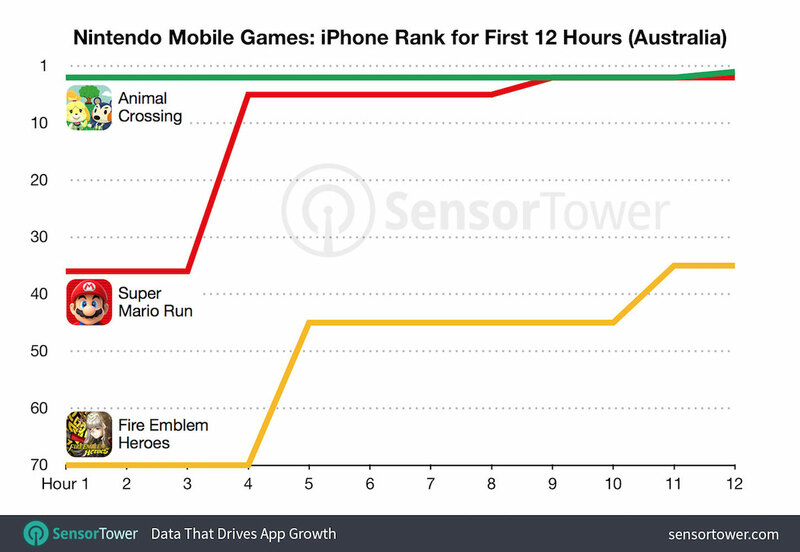 Hourly App Store category rankings from Sensor Tower App Intelligence show Nintendo’s third mobile game, Animal Crossing: Pocket Camp, off to a strong start in its Australian soft launch on iOS. According to the data, the game reached No. 1 among all iPhone apps faster than Nintendo’s previous mobile releases, Super Mario Run and Fire Emblem Heroes, hitting the impressive milestone within 12 hours of its launch on October 25. Comparatively, Super Mario Run debuted just below the number 40 ranking. It then hit number 2 after 12 hours on the App Store in Australia, and finally obtained the number 1 spot 14 hours after its soft launch in the country last December. Fire Emblem Heroes was ranked at number 35 at the 12 hour mark of its respective Australian soft launch earlier this year, and only made it as high as number 13 among all iPhone apps. Fire Emblem isn't quite as well-known a franchise as Mario or Animal Crossing, leading to low download rates on launch day in the United States. Sensor Tower also reported that Animal Crossing: Pocket Camp is currently ranked at number 117 among the top grossing iPhone apps in Australia. 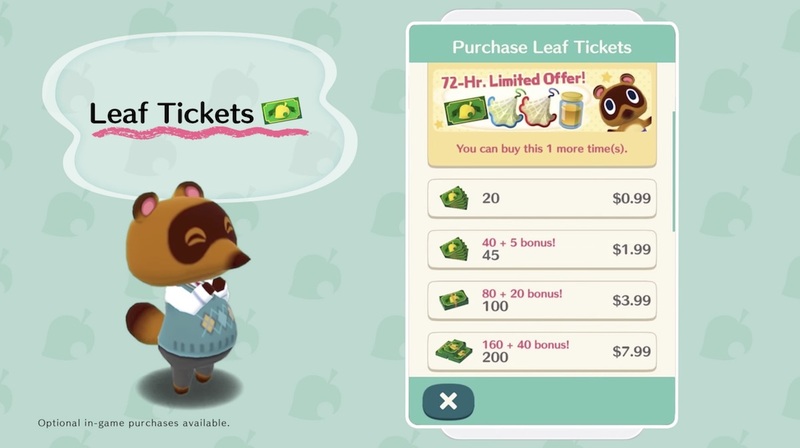 The game uses "Leaf Tickets" as its form of in-app purchase, allowing players to circumvent certain lengthy wait times for item and furniture building, supplement tickets for crafting materials, add in exclusive animals to their town like Tom Nook and K.K. Slider, and more. Next, Animal Crossing: Pocket Camp is set to launch worldwide in late November, although Nintendo hasn't yet confirmed a release date. You can pre-register to be notified as soon as the game hits the App Store in your supported country on Nintendo's website right here. Wouldn’t it be cool if super smash bros got released on iOS? I would rather have a full animal crossing game on the switch, but this mobile game might end up being better just because you can play it at random times. True, but even so, Nintendo has been building momentum from a low point of weakness. They've been pretty good about staggering releases so far this year. Australia might be a smaller market, but it's strange for them to discount it considering until recently they were having horrible earnings and this time last year many people were predicting the Switch would be a failure. Crazy how quickly the tides can turn. Maybe they just don't see them competing, but this is a crazy time of year for gaming and entertainment in general with Netflix shows like Stranger Things and holiday movie releases. Lots of competition. It's easy to get overwhelmed. I see what you're saying:) I still don't really think about Switch releases and iPhone releases in the same mindset. If this was AC on Switch, sure it would be an insane time to launch both games. But it's just a mini AC launching to everyone a month-ish after a huge Mario game. I'm surprised Animal Crossing is doing so well. I know plenty of people who play Mario games and a few that play Fire Emblem... I know none that play Animal Crossing. Is Animal Crossing just big in Australia, or Mario and Fire Emblem small there, or is the group of people I know just an extraordinarily poor sample for gauging how many people play Animal Crossing? It's hard to say with this sort of thing, because I'm kind of the opposite. I know more people who are far more passionate about Animal Crossing (myself included) than Mario or Fire Emblem. I haven't played the game yet, but I'm really optimistic about how it'll turn out on iPhone. If it is as fun and addictive as the console/portable games, it could easily blow up here as well. A big contributing factor is probably that it’s only available there. I made an Australian account just to download it.